Not content with the pile of apples residing in my fridge (even after the apple crumble cake) I was set on baking something delicious. And that I did. If you count throwing them in the oven as baking. 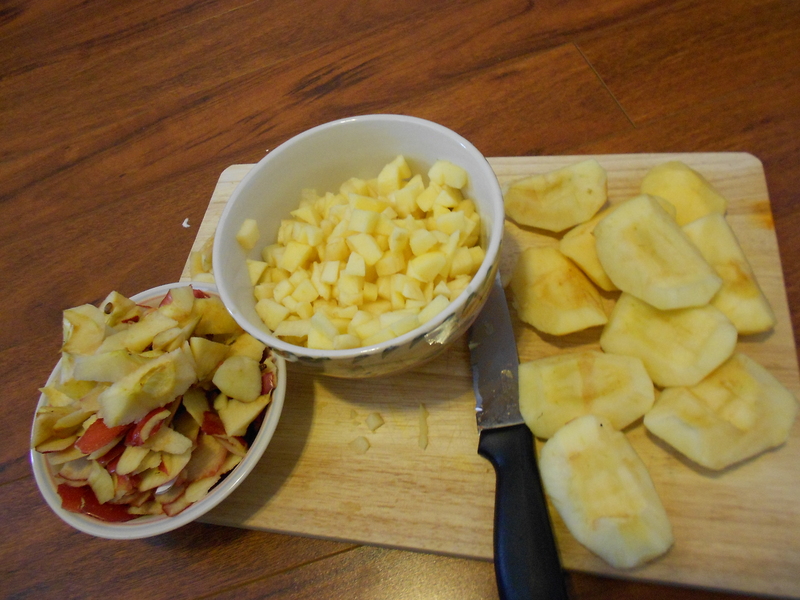 Apple chips are the easiest thing in the world to make. 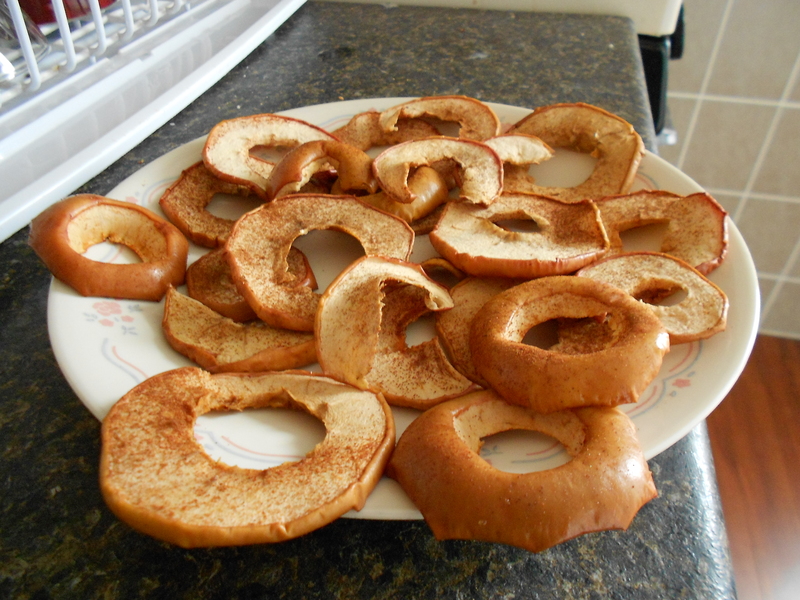 Just cut the apple into rings, place it on a sheet, sprinkle with cinnamon and brown sugar. Bake for 1 hour, flip, bake for another hour. The best part of it all? (They are not done, so I cannot say that the taste is the best, yet). YOUR HOUSE WILL SMELL DELICIOUS. P.S. : They are delicious, some of the thicker ones are a bit soft still. Turns out you gotta cut them as thin as possible. I maintain I did well given the giant knife I was wielding. Up next: what to do with 6 bags of frozen strawberries? Nothing beats walking for an hour with snow blowing in your face the whole time just so you can get to a restaurant five minutes early for fear of no seating and the sought after food item being sold out. 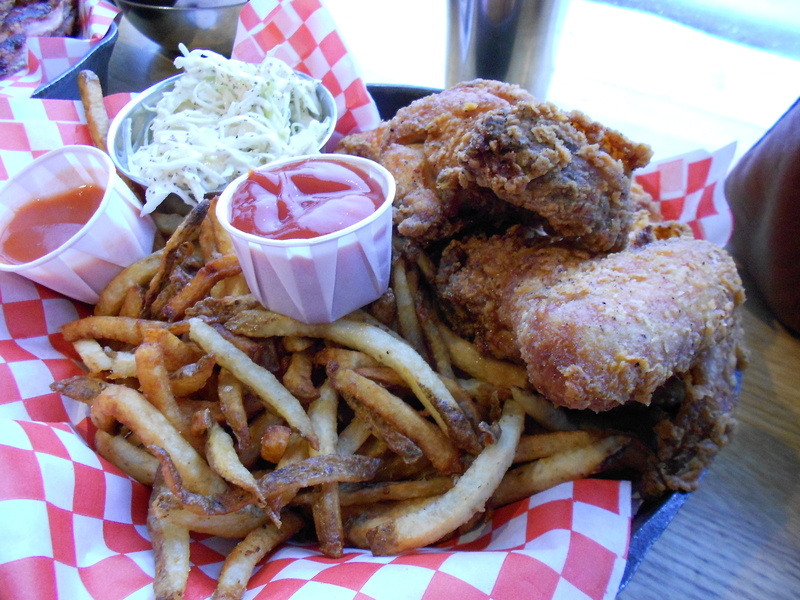 The Stockyards, voted best ribs, sells fried chicken and ribs only on Fridays and Sundays. We were determined to get some ribs before they sold out. I tried calling ahead, but she told me to call back at 4:45 (they don’t start serving ribs until 5pm on Fridays). That was the plan, however I got there at 4:45 and instead opted for sitting down inside, away from the snow. She was nice enough to let me place my order early, and to hold it for me until Brent got there. Of the two meals however, I preferred the chicken. 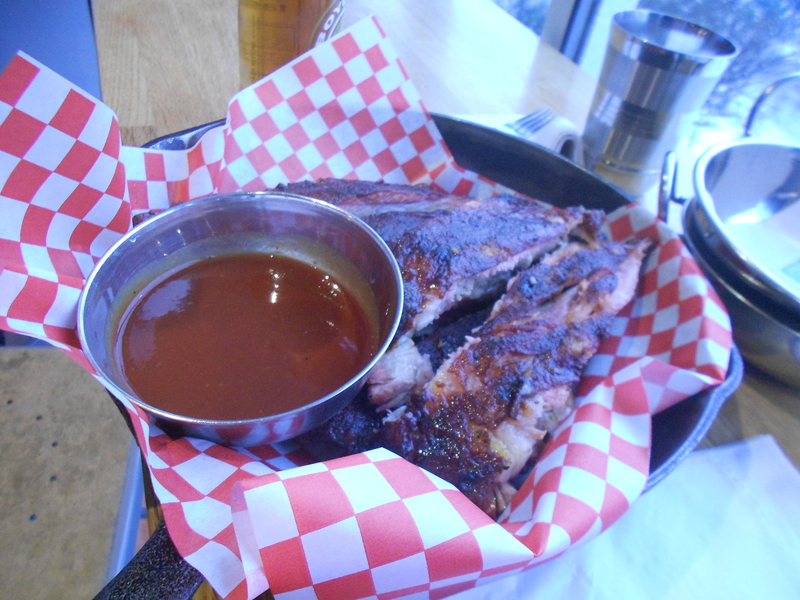 I like my ribs saucy more-so than the dry-rub. They were still among the best ribs I have ever had. There was no way we were going to finish the giant mountains of food before us. Leftovers! And here is where the tables turn. The next morning, the ribs were even more delicious! Somehow sitting in the fridge overnight made them more flavourful (I am guessing the seasonings had more time to sink in, but I am no expert). What to do when you have an ever expanding collection of apples and episodes of Boy Meets World piling up on the DVR? Why, make an apple crumble cake of course. 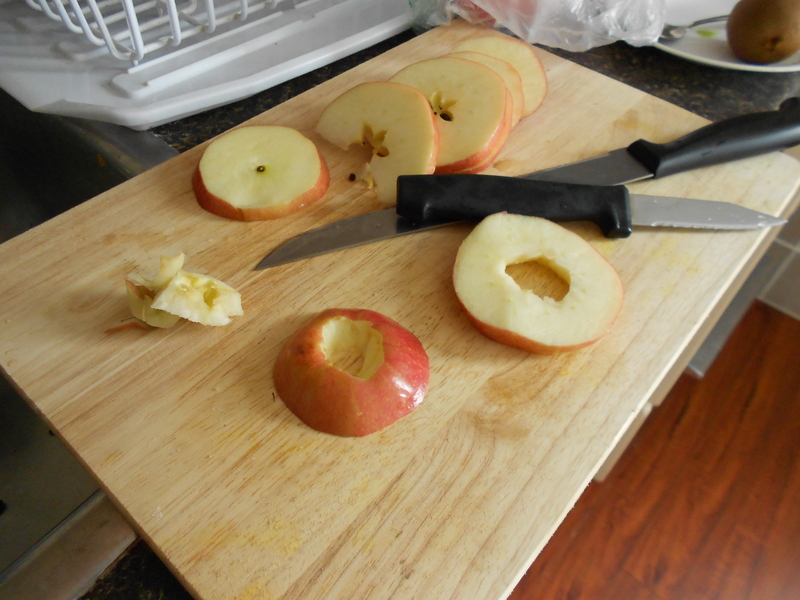 I could not find the small knife so my options were to peel and slice the apples with a butter knife or a giant carving knife. Easy choice. 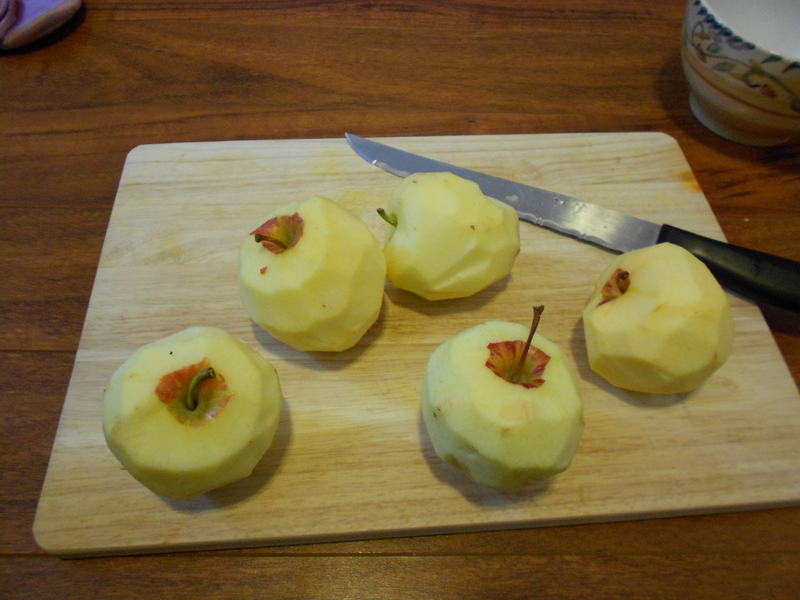 My apples suffered only a small loss. They were jagged but it was easier than using a butter knife. As it turns out, Boy Meets World is not even bearable anymore. Somehow the bright and cheery, every episode has a moral, theme to it is painful to watch. 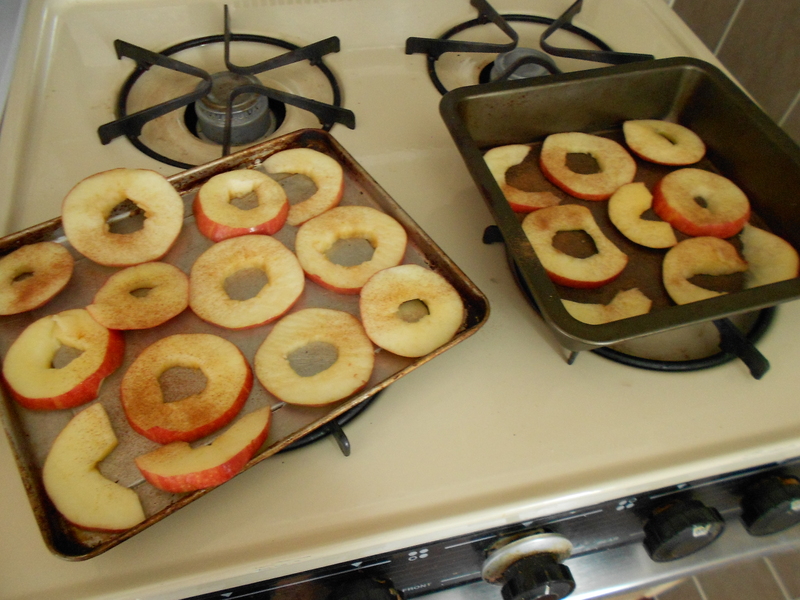 The recipe (of course from Pinterest) called for first pan-frying the apples. Pass. Too lazy for that, they will get enough baking time in the oven I figured. I also did not have any maple syrup, but maybe that is for the best. It seems like too many flavours: apples, cinnamon, vanilla… AND maple syrup?! Not having any proper mixing bowls and having used the only pot to make the batter in, I had to use a cereal bowl to make the crumble. Needless to say, half of it ended up on the counter, floor and me. 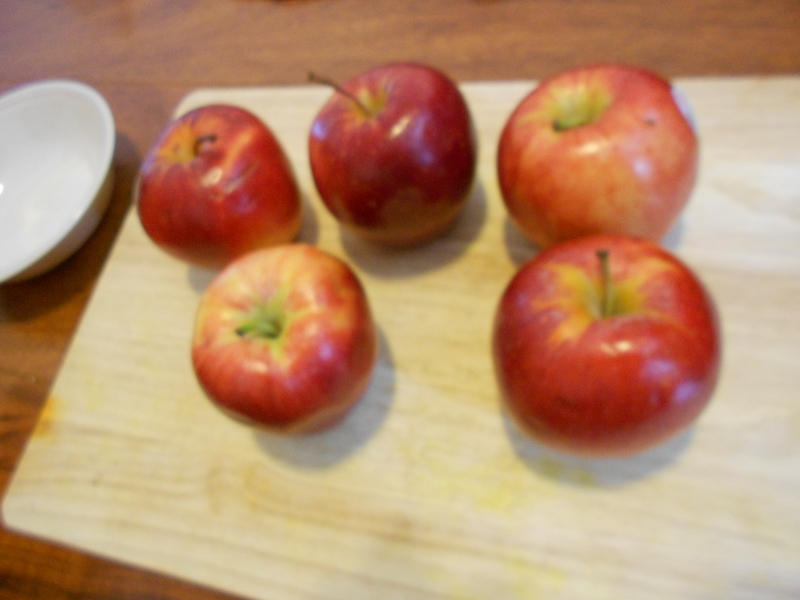 And as it turns out, 5 apples is twice as much as needed. Maybe that is why you fry them? They shrink in size? The cake lives up to it’s name. Trying to cut it was difficult as it half fell apart, crumbled if you will. Still tastes good, it’s just a bit difficult to eat. That might be because I was eating it straight out of the oven and burnt myself on the hot apple bits inside. Might be. 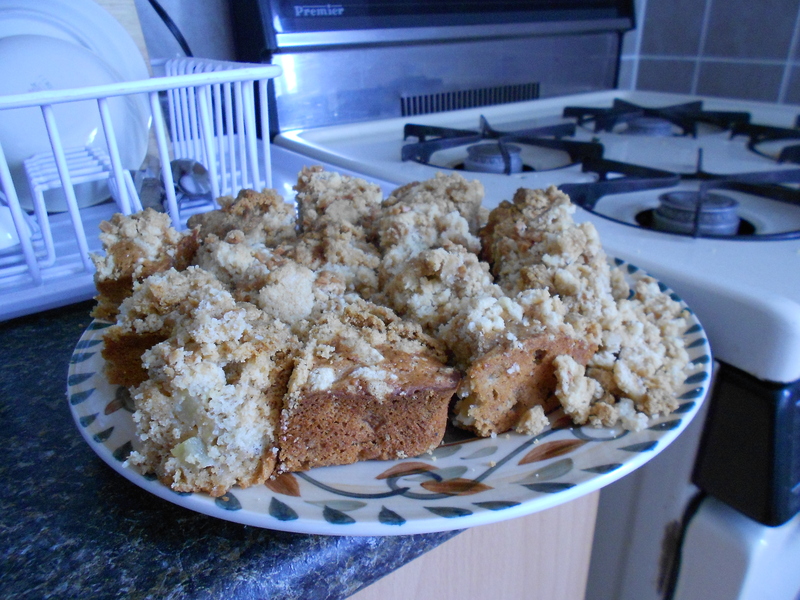 So in the end: I have an apple crumble cake tempting me, I finally used up the rest of the Skor bits (they’ve been sitting in the drawer forever- and fine, I ate half as a nibble while waiting for the cake to finish baking, I was hungry), and yet I still have a million apples in the fridge. I used up 3 apples, maybe not even. And I have more on the way. Every week my dad gives me a bag of apples, every week I eat maybe 3 or 4 apples? I am going to need a bigger fridge. Or some pectin and seal-able jars. Or I need to figure out how to poach apples. Up next: apple chips. Who did not see that one coming?! Have you ever found that pizza is just too darn messy a thing to eat? When you end up with pepperoni all over your shirt, tomato sauce all over your lips and cheese stuck to your chin, it just doesn’t look good. Enter the calzone, a pizza folded in half and all the pizza-goodness sealed in real tight. 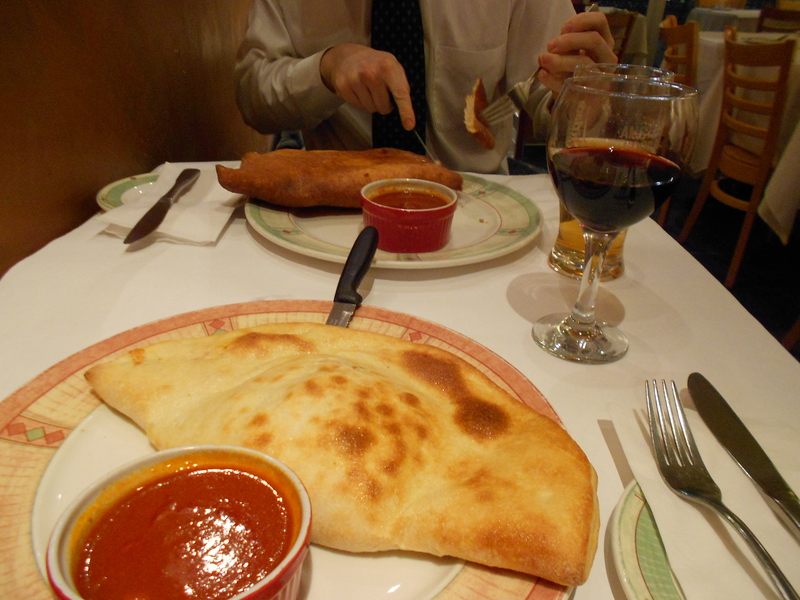 At Frank’s Pizza House, voted best calzone in the city, they have two versions on offer: deep-fried or oven baked. Given I was about to ingest a bread envelope stuffed with cheese, bigger than my head, I opted for oven baked. It made me feel a tiny bit better (enough to later ingest half a pint of Ben & Jerry’s). Brent had the deep-fried version. We each contend that our own choice was the better of the two. I still maintain that the deep-fried flavour overpowers the other flavours. The best part was that there were no pre-set options on the menu for calzones (but I guess you could just order the pizza and say make it a calzone) meaning you were free to mix & match as freely as you wanted without it being more expensive or a pain for the waiter/kitchen staff. As it turns out, prosciutto goes very well with pepperoni. It felt kind of odd to be sitting in a nice restaurant, eating with a fork and knife, what was essentially a giant Pizza Pocket (remember those?). The advantage to eating it with a fork and a knife was that you were much less likely to severely burn yourself as you would were you to just bite right into it. I am happy to report that neither of us sustained any damage due to ingesting super-hot cheesey bites. Needless to say, there were no cold pizza leftovers for the next day. It was just too damn good and we ate it all, so much food. For Valentine’s Day I decided to pack Brent a super-special delicious lunch- none of which I myself had made. The anchor point of a successful lunch is a good sandwich. I was initially going to go to Caplansky’s but changed my mind for a few reasons (it is winter, cold and Caplansky’s is comparatively far). One being that waaaay back in November-Decemeber, brown craft paper went up in the windows of the shop on the corner of Dundas and Dufferin. What intrigued me was that there were recipes for pulled pork and other meat-centric dishes written all over the paper! When Hogtown Cure finally opened, every time I went to the bus stop I was tempted by the smell of smoked meats emanating from the place. And yet still, somehow, we had managed not to go. The place was literally around the corner, and somehow we had not eaten there yet. I decided to take matters into my own hands and remedy that. I ordered the pulled pork and the smoked meat reuben, thus getting two different sandwiches with Hogtown Cure’s claim to fame: in-house smoked meat. I sat there waiting for my food, watching as dishes of mouth-watering sandwiches passed by. A guy went up to leave his plate and declared it was the best pulled pork he ever had. I was borderline drooling. Finally I got my order, however it was so large that it took up all the room in my bag. My initial plan had been to go grocery shopping after (a sandwich alone is not a lunch, it requires orange juice, chocolate milk and a brownie). One whiff of the sandwiches and I was jaywalking back across Dufferin for home. I split the pulled pork in half, and swapped it out with half the reuben. One for me, one for Brent. I promised myself only a quick little nibble, I was going to have them for lunch the next day (as in on Valentine’s Day) plus we were going out for calzones in the evening. Somehow (!!) 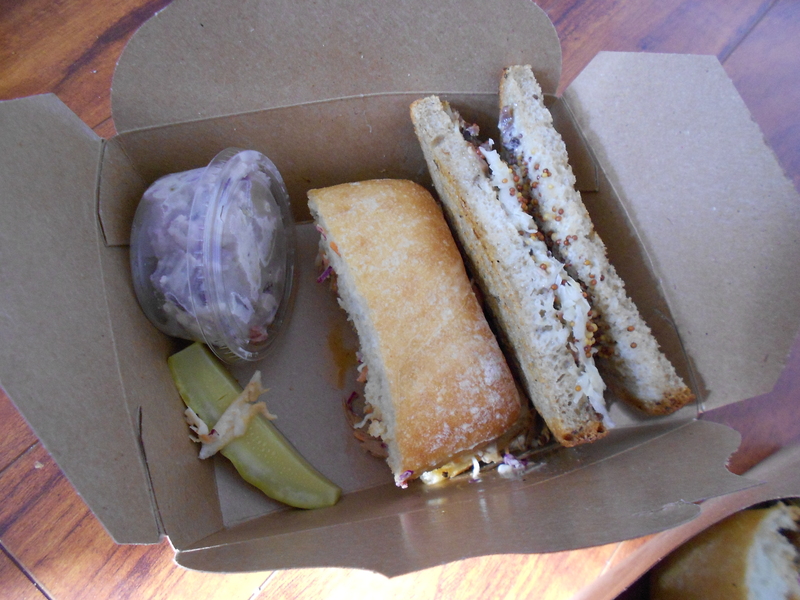 I managed to devour half of each sandwich. They were just so damn good. 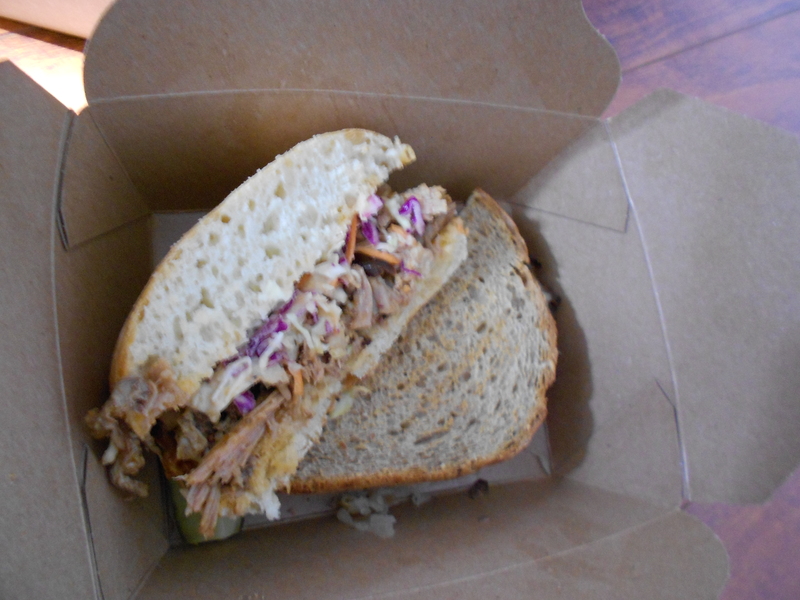 The reuben trumped the pulled pork, mostly due to the meat-to-bread ratio, but also: I have had better pulled pork. I do intend to go back, for while I was sitting there I noticed that they serve apple cinnamon french toast- french toast made with slices of baguette! What better way is there to spend a Saturday evening than in a Scottish pub? 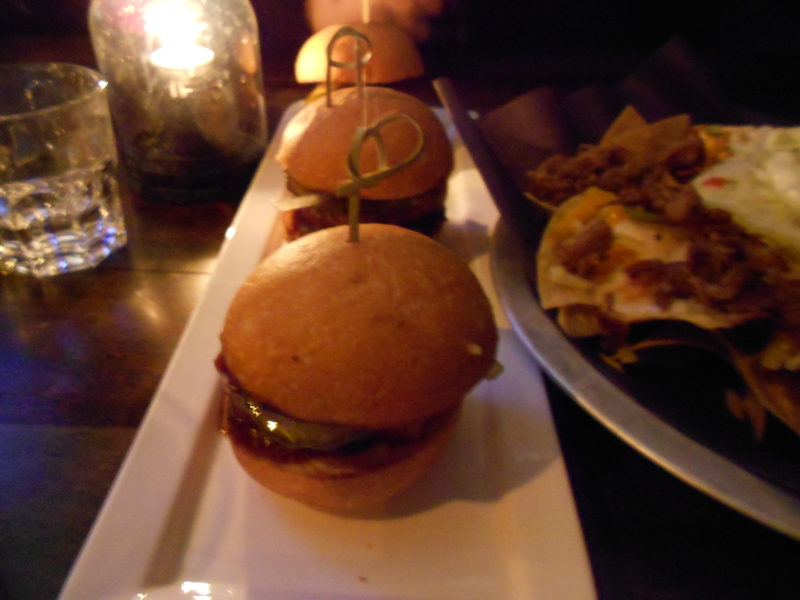 We had been meaning to go to the Caledonian for a while now, and finally: we did. I had been dying to try a deep-fried Mars bar for the longest time. But first, I had to eat dinner. There was only one clear choice: haggis. My options were haggis fritters or haggis with mashed potatoes and turnips. It took a lot of internal debate before I could decide. I figured I could just eat around the turnips. 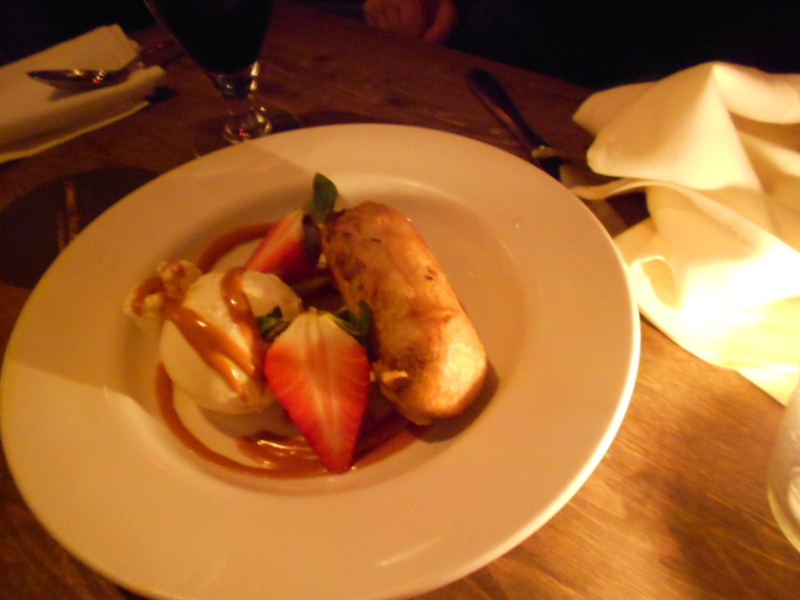 I was not expecting it to be presented so nicely, with the haggis in a nice round puck atop the mashed potatoes. The turnips were mixed into the potatoes, I was lazy about eating around them and ended up ingesting some, didn’t kill me it turns out. Turns out, for all the flack that haggis gets, it is actually really really good. It was savoury and meaty and just the tiniest bit spicy. Maybe this was some fancy version of it, but I loved it. I had wanted to order an Irn Bru and vodka, which Brent assured me (multiple times) was delicious- but they were out of Irn Bru! The heartbreak! Thankfully I had a back-up drink in mind: a hot toddy. The winner of the night, by far, was the deep-fried Mars bar. It was everything I had hoped for. Warm, chocolatey, greasy, so satisfying. It was among the best deep-fried desserts I have ever had, definitely competing for first place. Being the geniuses that we are, we headed out to SpiritHouse, voted best whisky bar in the city, for dinner… in the midst of a giant snowstorm. I can tell you, walking there was no easy task. I also almost wiped out on the stairs going in. Going to a whisky bar, for dinner, when you are not a big fan of whisky, might seem like an odd thing to do. However, if there is any place that might make me like whisky, this was it. It had to be. I was tempted by their special barrel-aged cocktails (whisky and other stuff, aged in a barrel) but you could tell that they were more than mildly expensive, the price was not even listed on the menu. 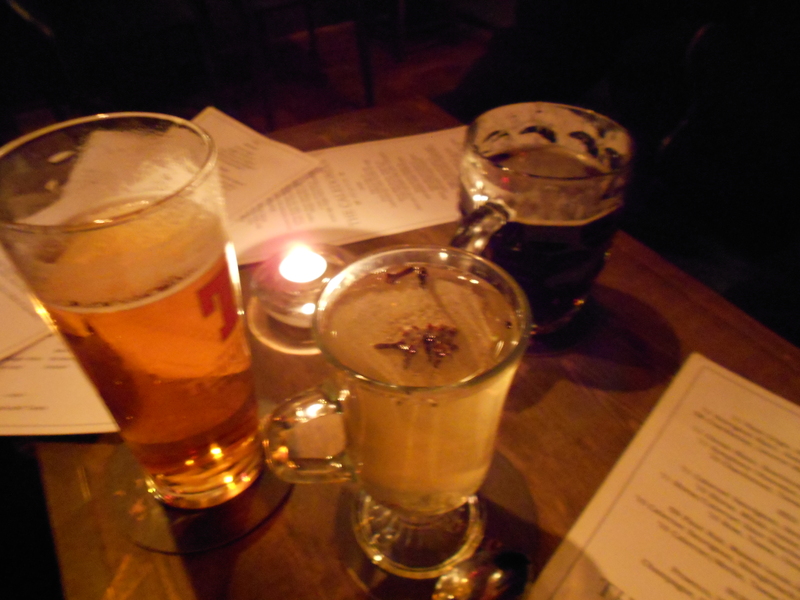 What was on the menu was an intriguing assortment of drinks made with whisky. A safe bet for me. Although I did have a sip of Brent’s whisky. At SpirirtHouse they give you the option of ordering a sampler of three different whiskys, which is a good idea if you are at a whisky bar with such an extensive list of whiskys. We ordered foods that contained whisky in them, in keeping with the theme. 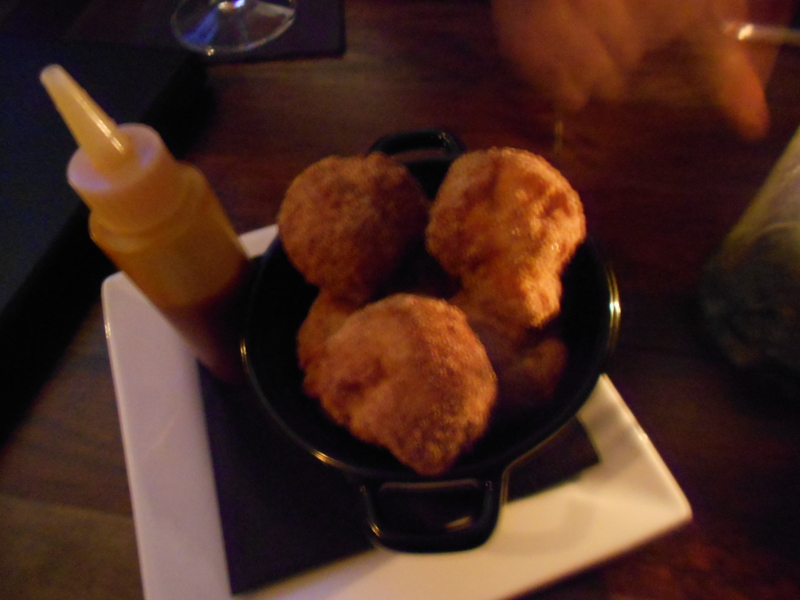 We had pork belly sandwiches with whisky BBQ sauce, duck nachos and for dessert: donuts with a caramel bourbon sauce. Biting into the pork belly sandwich I got a giant piece of fat. And it dawned on me that, obviously that would happen. It is pork belly after all. The BBQ sauce was the best part of the sandwich really. I am not a big fan of eating just animal fat. 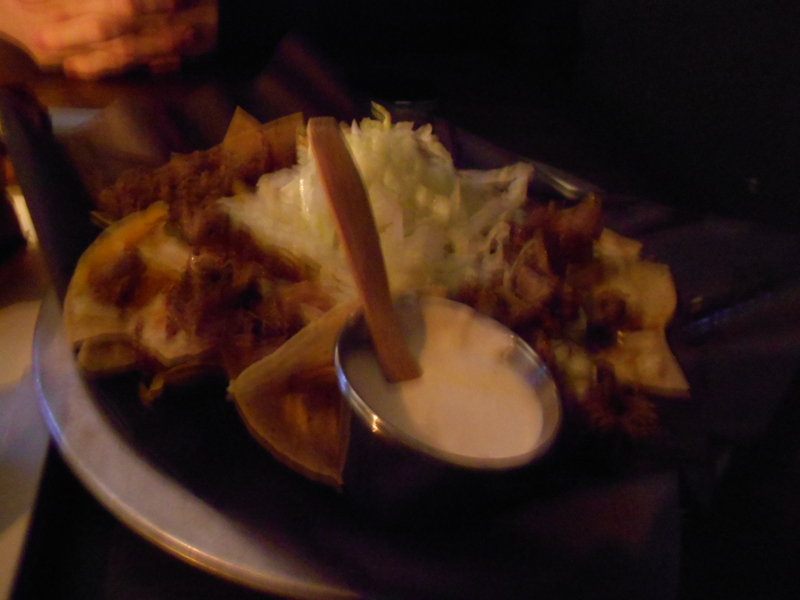 The duck nachos just furthered my point that duck does not go well when mixed with cheese (they are both greasy and the sweetness of duck goes against the taste of melted cheese, as seen with the duck confit pizza I did not like). The real winner was the caramel bourbon sauce. Hell, I would have eaten it straight after my BBQ-whisky sauce dinner. SpiritHouse is great for their huge selection of whiskys (it went on for a few pages), mixed drinks in which you can still actually taste the whisky and mixing whisky into sauces.